Didier Imbert Fine Art, Paris. E. Navarra, 'Jean-Michel Basquiat', Paris 1996 (illustrated in colour, p.58). 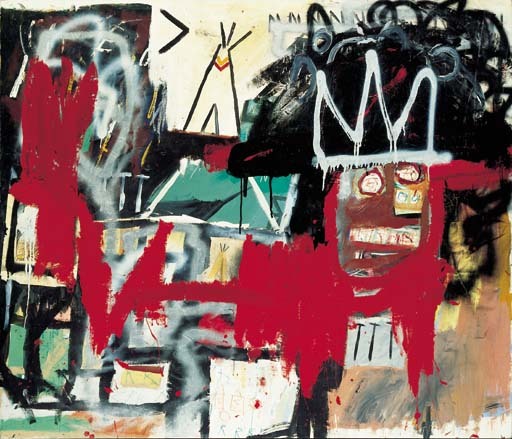 When Jean-Michel Basquiat painted the red, black, white and green dominated 'Untitled' in 1981, he had just given up spraying and due to some money he had earned by then, could afford some art supply. The works of this time often depict masklike faces that signal his interest in black subjects and symbols from New York street life, brought on the canvas in bold painterly gestures. This picture demonstrates Basquiat's growing ambition with his art. He was developing his very personal vocabulary, which became more and more refined throughout his career. 'Untitled' is a typical example for the artist's iconographic style. The core figure of the 'black king', who looks powerful as well as threatening due to the strong red and black surrounding his head, is pushed to right side heading outside of the painting. The symbol of the black king clearly comes from the artist's strong identification with historical and contemporary black heroes, as e.g. Malcom X, Jesse Owens or Charlie Parker, leading figures, who had influence and power, but also suffered from their environment. These mixed feelings are reflected in the black king's facial expression. The heavy red, applied over the partly fragile drawings, starting from around the face emphasis this ambivalent impression The crown itself was later to become a trademark for the artist. With this work the black tradition meets with American Indian issues, as symbolised by the tipi, which is drawn against a pale background in the upper centre and repeated in a smaller version right at the middle centre of the work. Coming himself from a multicultural background with his mother from Puerto Rican origin and his Haïtian father, it is not surprising that Basquiat's concern includes other cultural minorities. In this painting there are different stylistic elements to be depicted. There are some Cubistic forms in the lower left to be found, as well as 'Action paintings' dynamic strokes in black and white showing his influence from his first insight in the art of Picasso, Dubuffet, de Kooning and Pollock in the early nineties. The painting very much shows all the characterics that the artist was about to become famous for, but also a free joy in playing with topics and styles.